Filed to: life on mars?Filed to: life on mars? 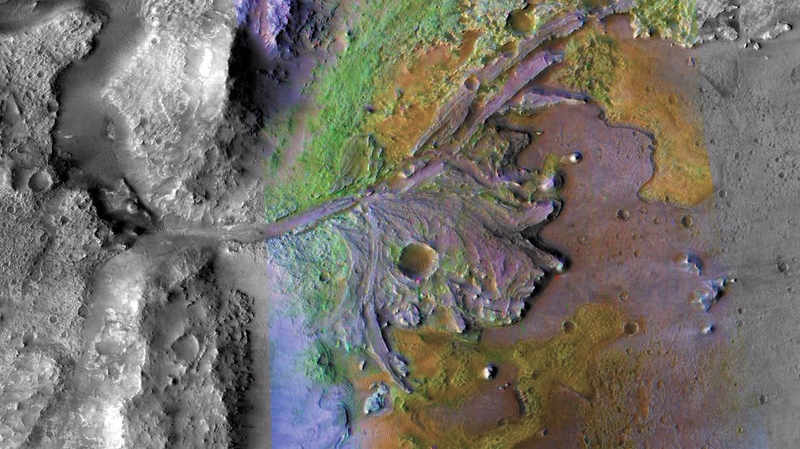 NASA has announced the landing location of its upcoming Mars 2020 rover: Jezero Crater. Mars 2020 is set to visit the Red Planet to take scientific data and hunt for past signs of life, and to better understand the planet for a future human visit. After a five-year-long whittling-down process, NASA has opted for the crater and its potential ancient river delta. “A delta is extremely good at preserving biosignatures,” said Ken Farley, Mars 2020 project scientist at NASA’s Jet Propulsion Laboratory, on a press call. If life ever existed on the Red Planet, perhaps its remnants were swept up in the river and deposited at the delta. Jezero Crater is a 500-meter-deep (1,640-foot) impact crater 45 kilometers (28 miles) in diameter that would have had water 3.5 billion to 3.9 billion years ago. Water appeared to have circulated into and out of the lake in the days when it flowed on Mars’ surface. Not only would a delta provide potential records of ancient life, but it could contain several different kinds of very old rocks that a river would have swept up and deposited that could present a fuller view of Mars’ history and composition. There also appears to be evidence of ancient volcanic activity at the location, Farley explained on a press call. Mars 2020 will follow up on discoveries made by past rovers Spirit, Opportunity, and Curiosity, which suggested that Mars may once have been hospitable to life. Mars 2020 will now hunt for evidence of ancient life, characterize the Martian climate and rocks, and gather understanding for a future human visit. It will also prepare samples that a later mission would gather and return. The selection process began with a list containing dozens of potential sites, followed by workshops to narrow down the candidates. It was based on five criteria, which essentially amount to the site being scientifically interesting and having the potential for evidence of ancient life and water. Scientists on the NASA press call stressed that they are not looking for present-day life, but instead for ancient life from when the Martian environment was potentially more similar to Earth’s. Once the list was down to four potential landing sites, scientists and engineers gathered to debate the options at a workshop in October before making the final recommendation. Jezero has long been a favorite, given its scientific interest. However, it has diverse terrain and landing there could pose potential challenges. NASA’s Thomas Zurbuchen, associate administrator for NASA Science Mission Directorate, noted that reaching the location is dependent on a new landing technique called “terrain-relative navigation” that would take photos, compare to a map, and divert the descending rover if necessary. This new strategy is no guarantee that the mission will be successful, said Lori Glaze, acting director of NASA’s Planetary Science Division. Mars’ thin atmosphere makes any landing extremely difficult, and there have been a number of failures. Most recently, the European Space Agency’s Schiaparelli lander crashed onto the planet’s surface in 2016 due to a software glitch. NASA will have another chance to test its landing capabilities next week, when the Mars InSight lander is scheduled to touch down. And while we’re all pining for a sign from the possibly dead Opportunity rover, Martian science continues onward. Just last week, the European Space Agency unveiled the preferred landing location for its own ExoMars rover, an area called Oxia Planum. The NASA rover is slated to launch in the summer of 2020.